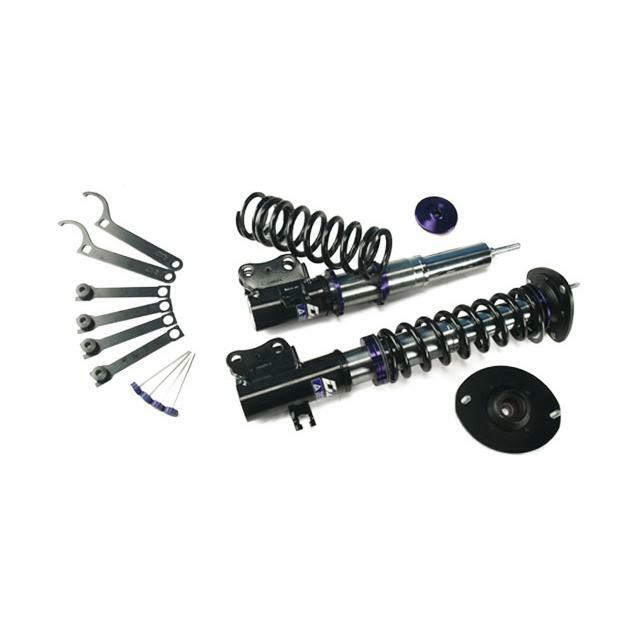 D2 Racing RALLY Asphalt suspension kits are built using steel mounts, elongated spring and stroke with matched dampening properties, and 44mm pistons to maintain performance and endurance during long-term use. These coilovers feature an inverted monotube strut design and 36-way damping adjustment designed to withstand the toughest rally conditions. D2 Rally Asphalt are adjustable -0.5″ to -3.0″ from factory ride height. D2 Racing RALLY Gravel suspension kits offer steel mounts, elongated spring and stroke with matched dampening properties to compensate for the rigors of off-road rally competition. Additional features include an inverted monotube strut design, 36-way damping adjustment, 55mm piston shock bodies*, and hardened rubber top mounts to reduce noise and improve ride quality. D2 Rally Gravel coilovers are adjustable +/- 1.25″ from factory ride height. Please specify Asphalt or Gravel with dealer when ordering.